In Isshinryu karate the vertical punch is considered a staple but it's hardly unique to the system. Supposedly at one time the standing fist was the predominant method of delivering a punch among Okinawan karateka; only later was the pronated variety introduced as a safety feature as it was considered weaker and less injurious for novices and kids. The fist delivered in the standing fashion - especially with the thumb on top - allows for a strong wrist alignment. The horizontal fist has the propensity to fold upon impact. Vertical punching allows the user to keep the elbow down, protecting the midsection through most of the range of motion. The twisting punch causes the forearm and elbow to naturally rise up and away from the body, allowing for a counter. The standing fist is conducive for the anatomically advantageous top two knuckles to make contact. The vertical punch also has a slightly longer range than the horizontal punch. The vertical punch is purported by many to be stronger (and faster) than the "corkscrew" punch. Conversely, some boxers claim that by adding the twist in a punch upon impact actually adds power. This technique has certainly been responsible for causing some serious cuts on a fighter's face. The horizontal punch does make an appearance in the Isshinryu kata Seiuchin as a block/strike against a leg or knee assault. Apparently, the horizontal fist's target area (the quadriceps) is more disposed to being deflected with this technique than with the trademark vertical punch. How do you punch? Does your style favor one type over another? I'd answer that question, but since Openhand has done a whole post on the subject, I'll just direct you there. In Muay Thai, we mostly use a horizontal fist. Actually, the fist is slightly turned over, so the thumb points downward at about a 45-degree angle (I'm giving rough estimates here...). The explanation my instructor gave me for the Thai style of punching was this--by turning the fist over, you create a structure that facilitates transitions to Thai-style kicks, elbows, and knees much better than a vertical fist. Of course, Muay Thai also uses glvoes and wraps. The older Thai systems may not use the same punching structure. Jack Dempsey recommends a vertical fist for straight punches in his Championship Fighting book, at least at long range. Every boxing coach I've met uses a horizontal fist, however. I like to inform practitioners of Isshinryu that "in the beginning" the vertical fist in practice/training was unique to us but over time that is no longer true cause I seem to see many others using it now. What I would say tho is the thumb on top is still unique to Isshinryu. Thanks for the link. It's very interesting, though the author's writing style seems to lack concision. Thanks for the feedback and info on Muay Thai. Thaiboxing's a brutal and time-tested sport which gives its techniques great credibility. I'd like to get my hands on that book by Dempsey. Maybe to Americans. The vertical punch certainly wasn't unique to Shimabuku or others of his ilk. I don't think other styles "borrowed" it from Isshinryu either. I believe Shimabuku's use of the vertical punch exclusively was unique to Isshinryu. The use of the vertical punch (with the thumb on top) certainly predates Isshinryu. According to historian and karate developer Shoshine Nagamine the vertical punch was adopted by Shimabuku from Chotoku Kyan. Also Mark Bishop's research (in his book Okinawan Karate) shows that the vertical punch can be traced back to proto-systems of karate such as Tomari-te (Isshinryu has Naha and Shuri-te roots) and was developed in other styles at roughly the same time (or even before) Isshinryu was being codified. John: I stand corrected, thanks! A very interesting post. 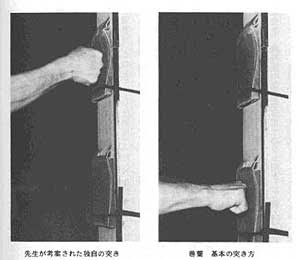 In shukokai we only use the horizontal punch but the wrist collapsing is definitely a disadvantage for someone like me who has very slim wrist. The advantages of the vertical punch that you mention make a lot of sense and I would imagine this style of punching would suit me better. Alas, my system requires me to persevere with the horizontal punch! Actually you might be using something similar to a standing punch in your dojo when you spar, but just aren't aware of it. The standing fist just conforms to what the body does most naturally. What you're doing in kata and two-person drills may be another thing. You should ask your instructor(s) for their take on the vertical punch. John: you can find PDF's of the Dempsey book online. Here's one link, but a quick Google search will turn up tons more. I wonder if the style of punch is also related to the stance. Isshin Ryu uses higher stances than Japanese styles and the vertical punch is better suited to hitting the solar plexes. However, once you drop into a lower stance seen in other styles the horizontal punch coming off the shoulder would effectively target the same area. Just a theory. IMHO all bottles serve there purpose. Thanks for that link on Jack Dempsey. Here's the hyperlink in case anyone wants to check this out. ...once you drop into a lower stance seen in other styles the horizontal punch coming off the shoulder would effectively target the same area. In Isshinryu we use zenkutsu-dachi (deep, long forward stance), sparingly, but when we do we're using open-handed techniques. ...all bottles serve their purpose. The picture at the top illustrates well why I prefer the horizontal punch. On the left, the fist is bent a lot, you can easily break an arm like this. On the right, the fist is straight so it's more reliable. I noticed that too. It might be just the angle, it's hard to tell. In practice - and I'm speaking from experience here - the vertical punch's wrist alignment is typically straight (not at all like the photo) and quite strong. John, as far as I know, it's straight if you punch in the middle area (chudan), and in case of head punch (jodan, like on the picture) you either need to bend the wrist (to strike with the proper part of the fist, forgot how it's called) or risk breaking the fragile ring and small fingers. I think the horizontal punch is more safe. I agree the vertical punch has its limits for high targets. As a rule of thumb the old time masters didn't advocate straight punching methods to the head anyway, vertical or otherwise. The open-handed variety (nukite, shuto, ridge-hand) were preferred for the high range (not exclusively), and almost always to soft tissue. Needless to say that any type of knuckle-strike poses potential risks for the striker.